The clip down pulley pennel is a distance pulley rig. The two hooks on the pennel rig enable you to present a large worm and/or squid bait in a natural fashion. This is a great rig for Cod. 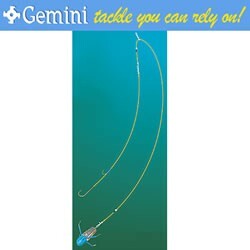 FREE Delivery on all Gemini Rigs for sea fishing over £100!! !